The state bird of South Carolina, the Carolina wren actually inhabits a far larger range than just that small state. These are one of the largest wrens in North America, and their bold songs and rich, warm colors make them a favorite of many birders, both in the field and in the backyard. Markings: Male and female birds are similar. The head, back, wings and tail are a dark rufous-brown. The head is marked with a long, thick white eyebrow and a white chin, throat and upper breast. The flanks and abdomen are a rich buffy-yellow that can vary from pale to an almost butterscotch hue. The undertail coverts are paler and marked with dark barring. The wings, back and tail also show dark brown barring. The eyes are dark and the legs and feet are pale pinkish. Juvenile birds are similar to adults but lack barring on the undertail coverts. The Carolina wren is more often seen than heard because of its preference for dense, brushy habitat. It is frequently found in moist deciduous forests and can also be prominent in suburban areas including parks and gardens, as well as in agricultural areas and forest edges. These birds do not migrate, and their year-round range extends throughout the eastern and southeastern United States from southern New York through Ohio, Indiana and Illinois to eastern Oklahoma, Kansas and Texas. They are also present throughout all of the southeast, including all of Florida. Carolina wrens are also found in eastern Mexico as far south as the Yucatan Peninsula. While these birds do not typically migrate, they can expand their winter range in mild seasons to be much further north and west of where they are most commonly seen. Vagrant sightings are also regularly reported north and west of the Carolina wren’s usual range. These are loud, noisy birds but their melodic warbling song is always welcomed by birders. The rapid syllables may be repeated 3-7 times per song, and male Carolina wrens are apt to sing at any time of day throughout the year as they claim and defend territory. A raspy, even-pitched buzz call is also commonly heard. 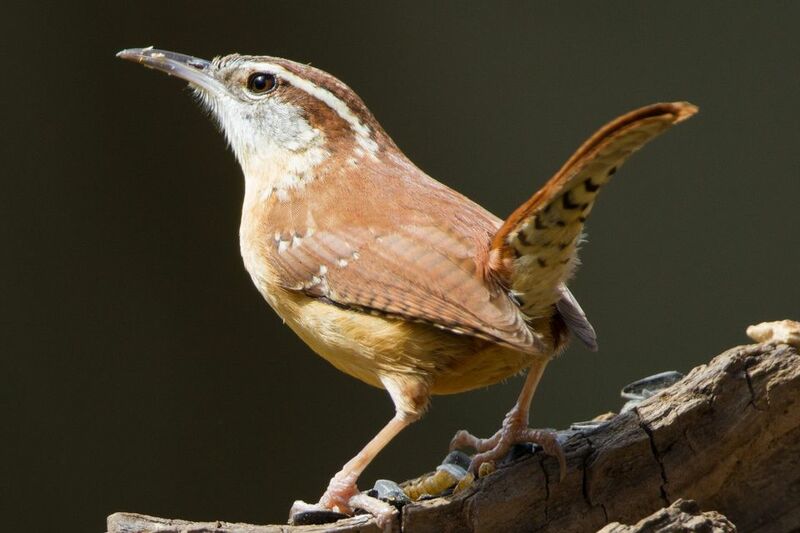 The Carolina wren is an active, energetic, inquisitive species that can be aggressive and will scold or chase intruders out of its territory, particularly near favorite feeding spots or nesting sites. Often found in pairs, these birds hop while foraging and will investigate every small nook and cranny for insects or spiders, even flying into open sheds or garages. They hold their tails cocked over their backs and will climb tree trunks while feeding. After the breeding season, they may stay in small family groups while that year’s hatchlings mature, but the young birds will be chased away to find their own territory in the spring. These are monogamous birds and both parents work together to build a nest of stems, twigs, grasses, leaves, moss and feathers in an open cavity or cozy niche. Carolina wrens have been recorded as nesting in odd places such as planters or hanging flower pots. They may build several nests before the female chooses which one is best for her eggs. The eggs are white or pale pink and marked with fine brown specks, and 3-8 eggs are laid per brood. A mated pair will raise 2-3 broods per year, with a greater number of broods more common in southern regions where the breeding season is naturally longer. The female parent incubates the eggs for 12-15 days, and both parents feed the altricial young for 12-16 days after hatching. The male parent may take over most of the hatchling feeding toward the end of that period if the female is already starting to incubate another brood. These birds will respond readily to squeaky pishing in the field, and they are popular in backyards. They frequently visit suet or peanut butter feeders and will use bird houses or winter roost boxes. Bird-friendly landscaping that includes thicket areas or brush piles can encourage Carolina wrens to visit more frequently, and leaving fall leaves available in the fall provides them an easy foraging area. These birds are not threatened or endangered, but because they can be sensitive to cold, the effects of harsh winters can be of concern for northern Carolina wren populations. Some northern population declines have been noted, but as yet there is no cause for grave concern about the future status of these birds.